Personalised pet fleece blanket embroidered with a name or text of your choice. Personalised pet fleece blanket embroidered with a name or text of your choice. 150cm by 100cm generous size super soft blanket for cats, rabbits, dogs or other domestic pets. 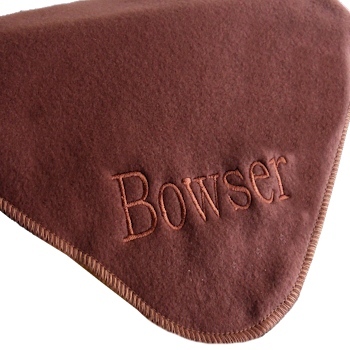 Brighten up your pets living space with their name embroidered for free. Personalised pet fleece blanket embroidered with a name or text of your choice. 150cm by 100cm generous size super soft blanket for cats, rabbits, dogs or other domestic pets. Brighten up your pets living space with their name embroidered for free. Super pet fleece blanket that will either make a great base for bedding or a snuggly cover to keep away the chills, easy care machine washable and tumble dry low or fast to air dry. A great and useful gift for your cat, dog, rabbit etc. These fleeces are a great size when folded to be a petting blanket to cover your lap when holding your pet. Size: Small size 75x100 cm Medium size 100x150 cm Large size 200x150 cm all sizes are approximate.